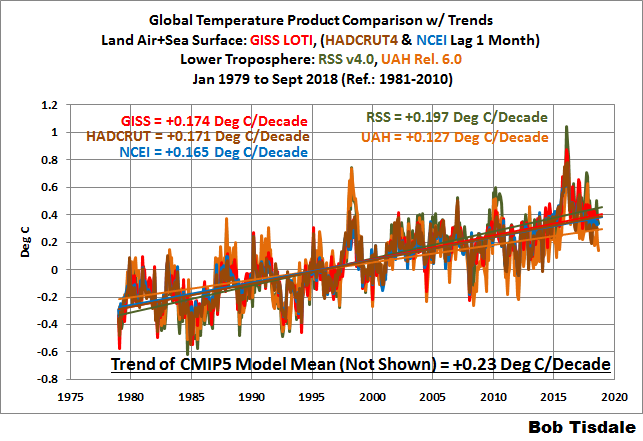 I’m adding Two Graphs to my Monthly Global Surface and TLT Temperature Updates. The new graphs are being added for a simple reason: to provide different perspectives on the increases in global temperatures since 1979. The graphs are of Berkeley Earth global land+ocean surface temperature data and RSS global lower troposphere temperature data, both in absolute (not anomaly) form. That way they include the annual cycles in temperatures, which are far greater than the warming that’s occurred since 1979, based on their linear trends. I’ve added the new graphs as follow ups to the post Do Doomsters Know How Much Global Surface Temperatures Cycle Annually? (WattsUpWithThat Cross post is here). I knew the RSS TLT data existed in absolute form, but, sadly, I forgot to include it in the “Doomster” post, so I will be including it in the monthly updates along with the Berkeley Earth surface temperature data. Figure 1 presents the Berkeley Earth global land+ocean surface temperatures in absolute form, with land surface air temperature data for Arctic sea ice (data here). This is created by adding the “Estimated Jan 1951-Dec 1980 monthly absolute temperature (C)” listed there to their respective monthly anomalies. The trend line is as determined by EXCEL for the absolute data, but the trend value is determined by EXCEL from the anomaly data (not illustrated). 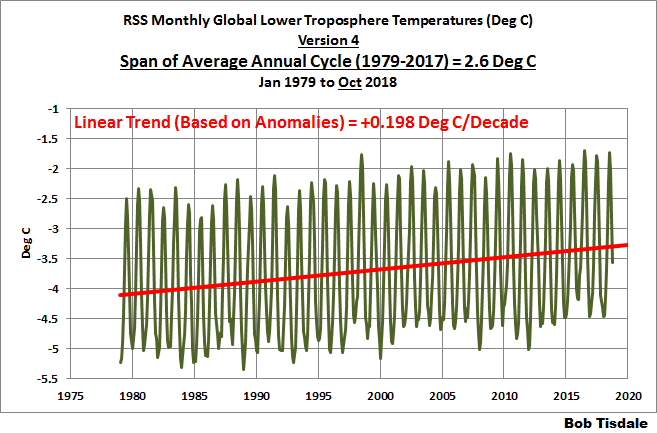 I use the anomaly data for the trends for a simple reason: with anomalies, I don’t have to worry about the start and end months to account for the impacts of the seasonal cycles on the trends. The 3.6-deg C span of the average annual cycle (for the period of 1979 to 2017) is listed in the title block. Figure 2 presents the RSS global lower troposphere temperature data in absolute form. That data are available to the public in easy-to-use formats from the KNMI Climate Explorer, on their Monthly Observations webpage, specifically the RSS MSU 4.0 TLT, webpage. There, the TLT data are presented in K, not deg C, the latter of which we are much more familiar, so I added 273.15 to the monthly K values to convert to deg C. As listed in the title block, the span of the average annual cycle (for the period of 1979 to 2017) is 2.6-deg C. The trend for the RSS TLT data is included in the trend comparison graph, not included in this post (example here). And, of course, in both cases, as mentioned above, the new perspective is that the average annual cycles are much greater that the changes in global temperature from January 1979 to October 2018, based on the linear trends. Have fun in the comments, and enjoy your day! The monthly update should be posted in a couple of days—everything’s ready and waiting for the update to the GISS LOTI data. This entry was posted in TLT and LOST Updates. Bookmark the permalink. 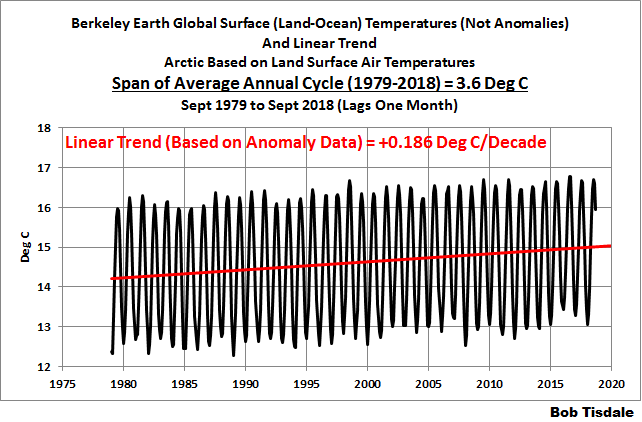 Pingback: October 2018 Global Surface (Land+Ocean) and Lower Troposphere Temperature Anomaly Update | Watts Up With That?